This last post doesn't deal so much with buying gifts for others, as it does making it easier for others to buy for you. Don't you hate it when you ask someone for gift ideas and all they say is, “I don't know”? That's not going to be you anymore. From here on out, I suggest you keep a wish list going for yourself. It doesn't hurt to dream, right? And the next time someone asks you what you'd like for Christmas, you can give them an answer…within their budget, of course. Often I will want a gadget shown on my favorite cooking show, or while I'm browsing through a magazine. No matter when an idea pops into your head – write it down. 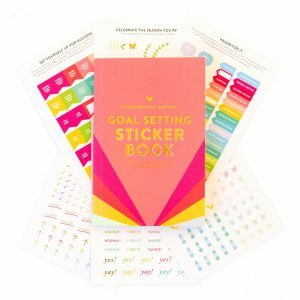 If you're a paper and notebook freak like me, this printable will help you keep it organized. You can download it here, or by clicking on the graphic. All you have to do is list the item, name the store it's from, and give it a price range. Next time someone asks you what you'd like for your birthday, you have an answer! However, if you prefer the paperless option, I have a few ideas for a virtual wishlist that I think you'll love. 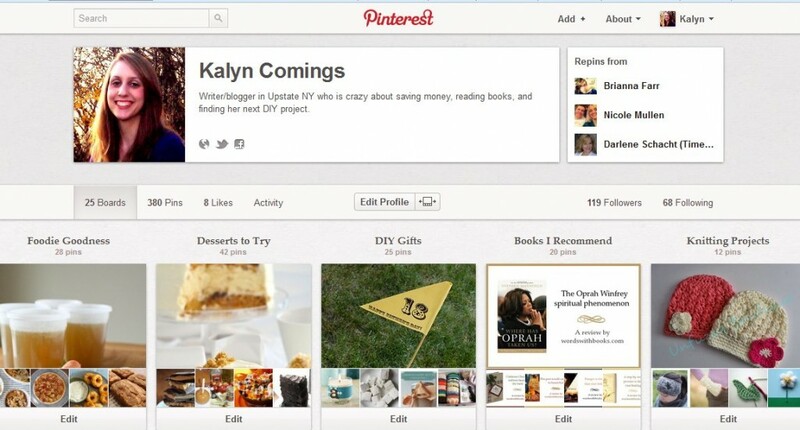 Do you spend a lot of time on Pinterest? It's addicting, isn't it? Why not put your browsing to good use and start a “Wish List” board for yourself. Anytime you see a product you absolutely love, pin it to your board and give the link to friends and family to access when the time comes. Even a board as to which color combinations you like, style of decor, and books you'd like to read can be really helpful. And if we haven't connected on Pinterest yet, you can find me here. Amazon is a great place to store all your wanted items, especially because you can find practically anything on there! They also has some pretty cool tools that go along with their Wish List. 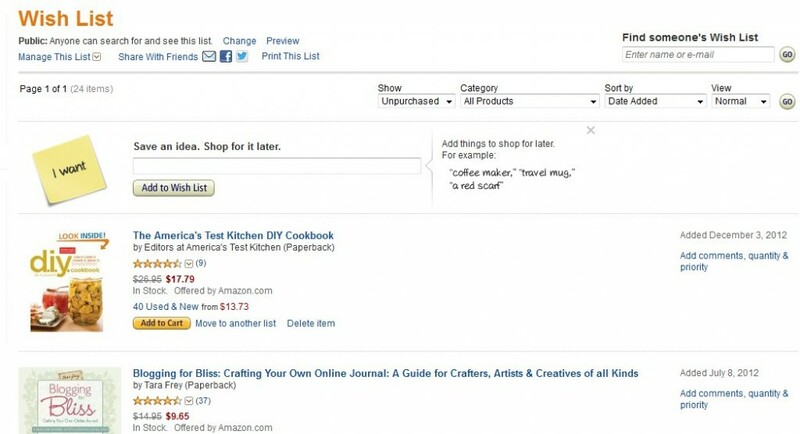 With their Wish List Toolbar installed, you can add any item from any wish list anywhere on the web. You also have the ability through Friends and Family Gifting to sync birthdays via facebook, get reminders, and see their own Amazon wish lists. 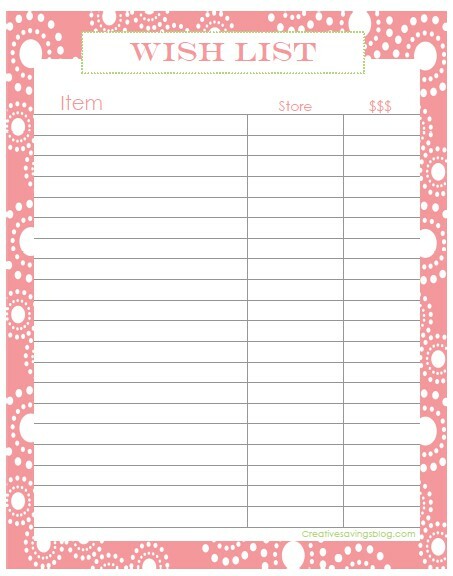 This will really help you keep all those important dates and gift ideas organized! I also like to keep a list going in Evernote. This is for when I'm out and about in the store and see something I absolutely love. I might not remember the item and price when I get home, so I opt to take a picture and file it away in the Evernote App. Many stores do not allow pictures to be taken of their merchandise, (a.k.a I got caught!) so you must do it discreetly. I suppose you could type it out on your phone, but then you're missing the whole visual appeal of it and why you loved the product in the first place. So, the next time your mom asks you what you want for your birthday or Christmas, you'll be prepared with wish list in hand. And you're also more likely to get exactly what you want. Now that we're officially done with this series, I'd love to know one gift you bought/made for someone and why! 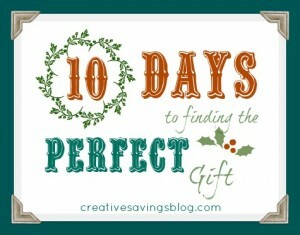 For all previous posts on finding the perfect gift, visit the series landing page. I'm going to be taking next week completely off from blogging. It's important for me to take time for my family, and for myself. I want to make sure I'm giving you the best content possible and I can't do that if I'm completely burned out. I wish you the merriest of Christmases, and I'll see you again in the New Year. I have lots of new exciting things planned!